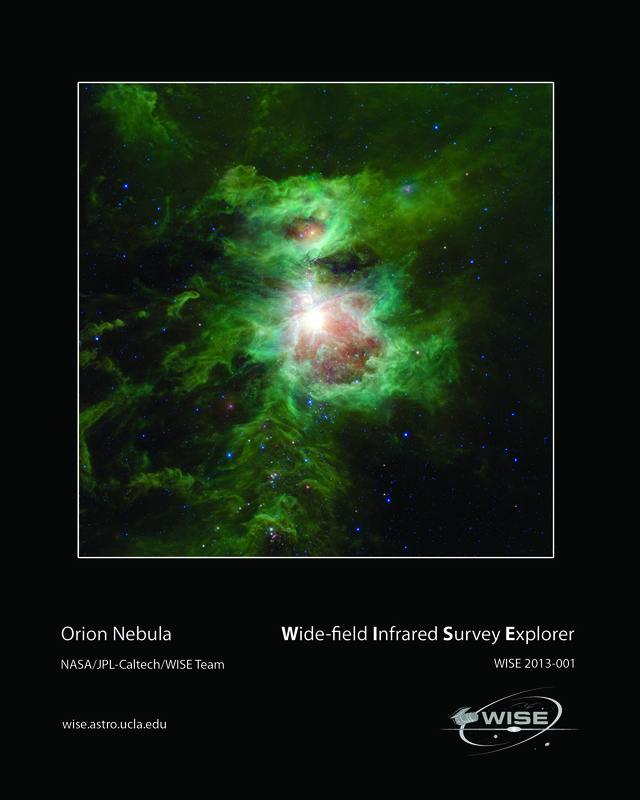 The Great Nebula in Orion is featured in this sweeping image from NASA’s Wide-field Infrared Survey Explorer, or WISE. The constellation of Orion is prominent in the evening sky throughout the world from about December through April of each year. The Orion Nebula (also catalogued as Messier 42) is located in the sword of Orion, hanging from his famous belt of three stars. The star cluster embedded in the nebula is visible to the unaided human eye as a single star, with some fuzziness apparent to the most keen-eyed observers. Because of its prominence, cultures all around the world have given special significance to Orion. The Maya of Mesoamerica envision the lower portion of Orion, his belt and feet (the stars Saiph and Rigel), as being the hearthstones of creation, similar to the triangular three-stone hearth that is at the center of all traditional Maya homes. The Orion Nebula, lying at the center of the triangle, is interpreted by the Maya as the cosmic fire of creation surrounded by smoke. The metaphor of a cosmic fire of creation is apt. The Orion Nebula is an enormous cloud of dust and gas where vast numbers of new stars are being forged. It is one of the closest sites of star formation to Earth and therefore provides astronomers with the best view of stellar birth in action. Many other telescopes have been used to study the nebula in detail, finding wonders such as planet-forming disks around newly forming stars. 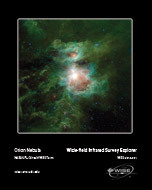 WISE was an all-sky survey giving it the ability to see these sites of star formation in a larger context. This view spans more than six times the width of the full Moon, covering a region nearly 100 light-years across. 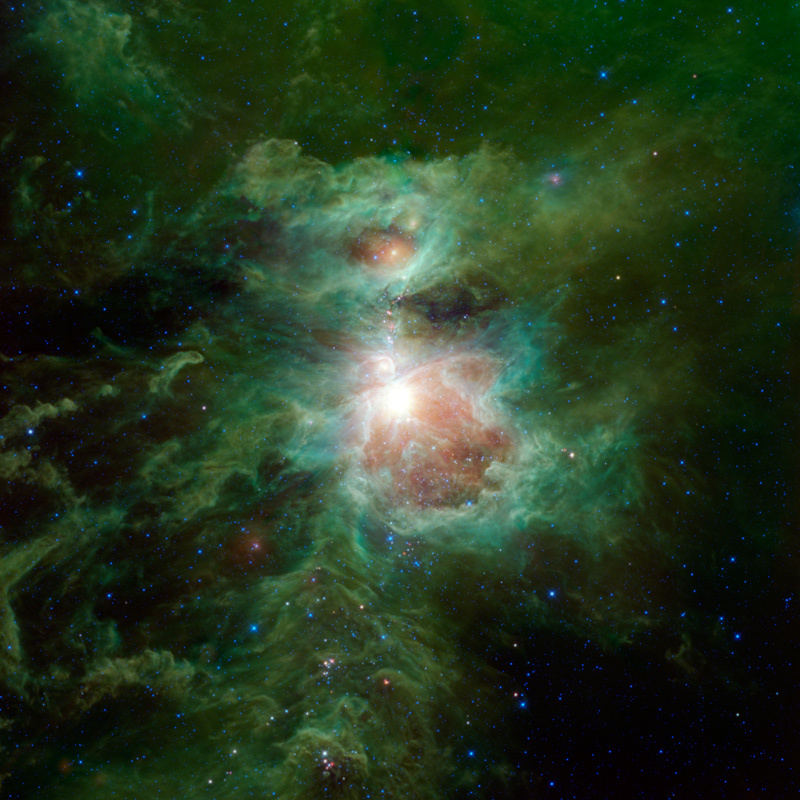 In it, we see the Orion Nebula surrounded by large amounts of interstellar dust, colored green.